Studio in Keenesburg Monday & Thursday Classes. Advance Round Club Denver, Tuesday Evenings Phase IV-VI (Wheat Ridge Grange 3850 High Ct.). 3rd Sunday Advance Party Dance in Denver. Instructing a new class at Aims College in May on Wednesdays and in the fall on Fridays. 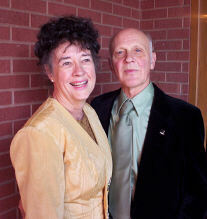 Jim & Bonnie began square dancing in 1969 then round dancing in the following year. both Jim & Bonnie's mentor. The Bahr's are charter members of Roundalab and past board members of URDC. the rumor it stands for "I Sort Of Teach Dancing"). in East Berlin at that time. It was an experience none of them will ever forget. one at Northern Lights State Festival. routines for a week they were teaching in Red River, NM entitled "Red River Waltz"